George R. DiFelice Sr., 64, of Bethlehem Township, Pa., died Tuesday, April 24 (2001), in St. Luke's Hospital. He was an instructional assistant in the special education department at Nazareth Area High School for the past two years. Before that he was a senior staff accountant in the billing division at Bethlehem Steel Corp. for 30 years before retiring. 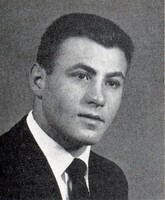 He was a teacher and assistant football,wrestling and baseball coach at Notre Dame High School from 1964 to 1968. Born April 11, 1937, in Martins Creek, he was the son of the late Alfiero and Viola DiFelice. He was a member of sacred Heart Catholic Church in Bethlehem Township. He was deputy director and radiological officer for the Northampton County and Pennsylvania Emergency Management agencies and one of 49 senior radiologocal instructors in the state. He was also active in the National Emergency management Institute Adjunct Facility in Emmesburg, MD., and the Radiological Emergency response Orerations. He was a member of the Amateur Softball Association of America, where he served on the exedutive committee. He and his wife, the former Frances A. Donoso, observed their 37th wedding anniversary in August. In addition to his wife, he is survived by a son George J. jr. of Allentown; a daughter, Sandra Rezac of Fountain Hill; two brothers, Gilio and Franklin, both of Martins Creek; and a granddaughter. Services will be held at 9:30 a.m. Thursday in the Long Funeral Home, 500 Linden St., bethlehem. A Mass of Christian Burial will be celebrated at 10 a.m. Thursday in the church, First Street, Bethlehem Township. Call from 8:30 a.m. Thursday to time of services in the funeral home. Burial will be in Holy Saviour Cemetery in Bethlehem.